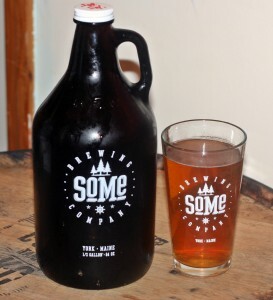 Picked up this growler in one of my recent trades with someone from Mass. 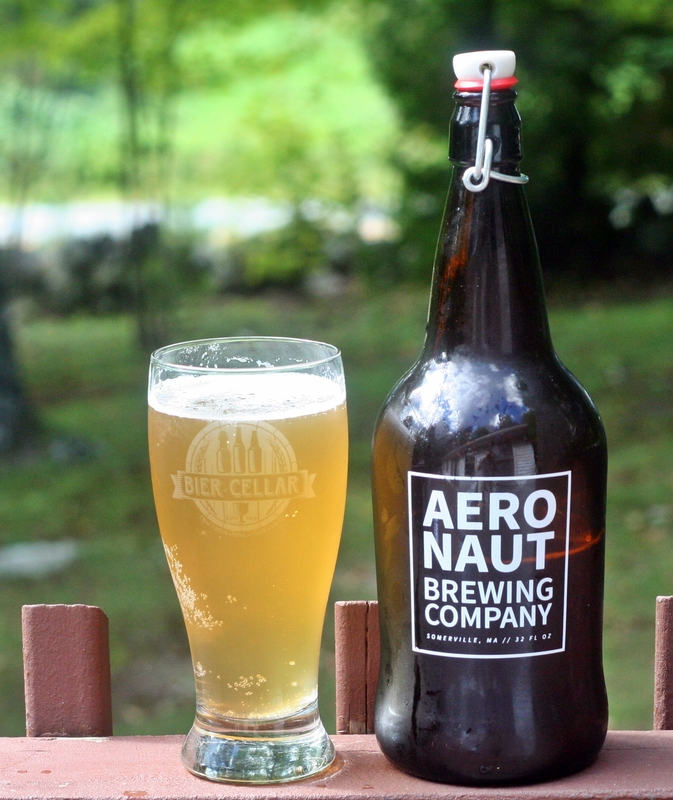 This is my first beer from Aeronaut and I opted for their Berliner Weisse as it is only 2% ABV and a style that I have been enjoying this summer. 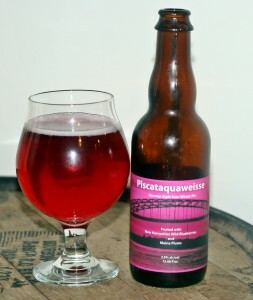 This is now the lowest ABV beer that I have ever had with the previous low being 2.9% from Blue Lobster’s Piscataquaweisse. 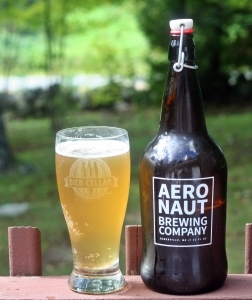 Aeronaut’s Berliner Weisse is a straight up Berliner with no fruit added. It pours a pale yellow with a thin white head that disappears almost immediately. This is typical for the style and it does not take away from the beer. Aroma has a light tart funk but is very mild. Taste is a bit tangy with some lemon and slightly acidic. Enjoyable beer and super easy to drink. I have not had too many Berliner Weiss’ but it seems the ones I enjoy have some fruit added like Blue Lobster’s from above or Night Shift’s Ever Weisse which has strawberries, kiwis and hibiscus flowers. Brewers Description: Champagne of the north – delightfully tart with fantastic lightness. I am becoming a big fan of low ABV beers and this one certainly qualifies at a very low 3.1%. Also really enjoying the resurgence of the Berliner weisse style with loads of flavor and a bit of tart to keep your taste buds wanting more. Dustin does a great job with Limericker Weisse as it pours a light yellow with a thin white head that dissipates quickly. Aroma is mild but you get a little lemon sour as a hint of what’s to come. Taste is really where this one excels with that sour lemon and very clean dry finish. Limericker is a great summertime beer from a great new brewery in Southern Maine. A visit to Limerick should be on everyone’s list of things to do this fall. 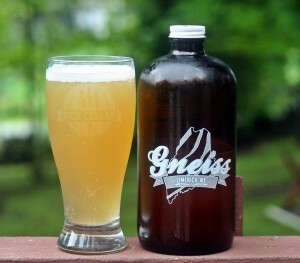 Brewers Description: Limericker Weisse is our first sour beer. Our take on the classic Berliner weisse style, Limericker is tart and refreshing, perfect for a hot summer day. The unique flavor is achieved by utilizing a sour mash and fermenting with a mixed culture of our house yeast and lactobacillus. The sour mash imparts a citrus like acidity and the mixed culture leaves the beer dry with just a hint of the banana notes found in our flagship Gneiss Weiss. Grabbed this one as part of a mixed six pack at Beer Cellar Portsmouth and had been lingering in my beer fridge for a while. Decided to open on a hot summer afternoon and I was glad I did. Pours a bit clearer than I would like but I may have failed to swirl the bottom of the bottle to get the remnants as you should with a hefeweizen. Other than lot I love the coloring a the slight white head. Aroma is a spicy banana bread and quite nice. Taste follows and adds a bit of clove. Overall a nice hefeweizen which is a style of beer that I really enjoy during the summer. Brewers Description: Inspired by traditional Bavarian techniques, Kellerweis is a true artisan experience. With Kellerweis, we brew in open fermentation tanks—a process rarely seen today—to let the ingredients truly shine. The result is a hazy wheat ale—untamed, raw and alive. 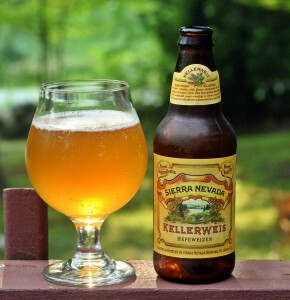 With a full, fruity aroma and notes of spicy clove and banana bread, Kellerweis is a truly unique brew. Night Shift makes some excellent beer and I really need to make the trip down to Everett to visit their tap room. Checking their site today and they have 15 beers available for tasters; 9 beers available for growler fills and 5 different bottles available for purchase. Few breweries in the Northeast have the wide range of styles and this many beers available. The list includes everything from the sours, to a summer porter and even a resinous DIPA. This bottle was brought back by Paul who took a trip to Mass to tour some breweries and he was nice enough to grab me a couple bottles. Appearance is a nice orange with a slightly pink hue, not as pink as JoJo. Almost no head which seems to happen with sours. Aroma has lots of fruit, not fruit from hops like you get in the IPAs but actual fruit. Also get some slight funk and floral notes. Taste was my favorite part of this beer as it starts with a tart lemon with some strawberry and as it warmed I picked up more of the hibiscus. Funky and slight acidity make this a very complex beer. I will be making the trip to Night Shift soon and will post when I am headed that way, be sure to comment if you want to tag along. 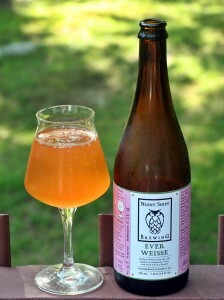 Brewers Description: Berliner Weisse style sour ale aged on strawberries, kiwis, and dried hibiscus flowers. Sold exclusively at our brewery in Everett, Ever Weisse is what most beers are not – hopped minimally, soured extensively, pink in color, aged on hand-chopped fruit, brewed in tiny batches, and available at at only one location. It sips fruity and tart, with a touch of tangy sweetness. It does not taste like other beers do, nor should it. 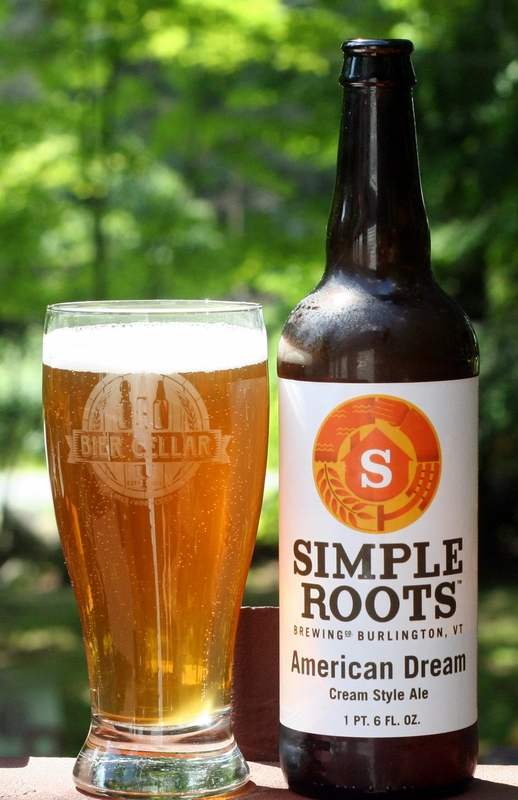 Simple Roots is a new brewery located in a residential neighborhood in Burlington Vermont. Because they are in a residential neighborhood the brewery is not open to visits from the public and you cannot purchase beer there. 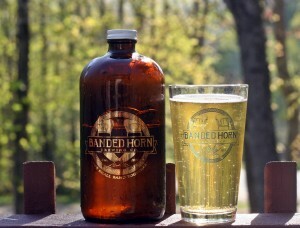 They sell at a couple of local bottle shops and farmer’s markets. You can check out their FB page below for more info on when and where they will be. 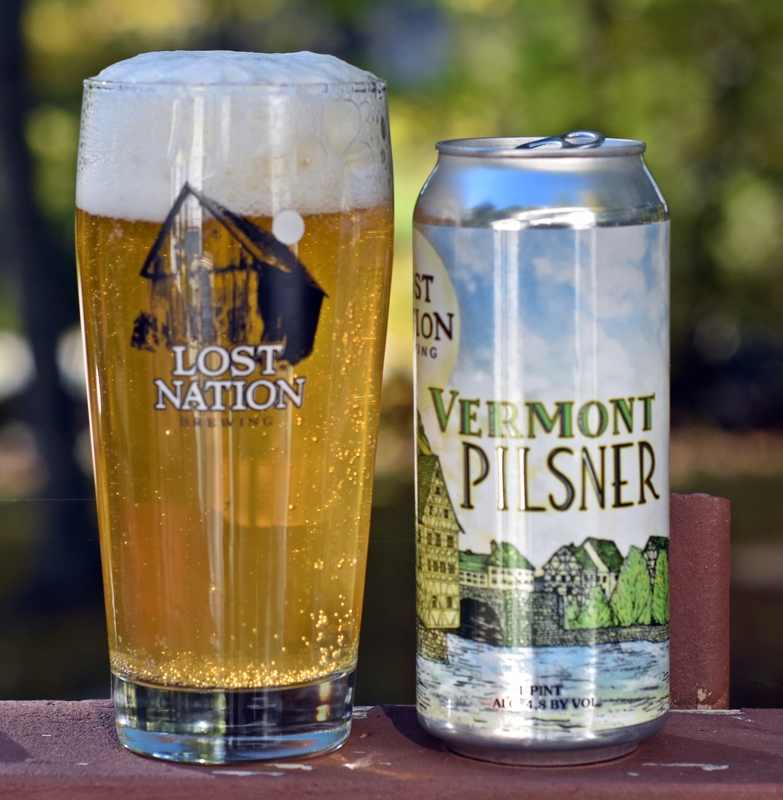 Their goal is to brew beer to style more so than trying to keep up with the ultra hoppy beer that many Vermont brewers are making. The first beer I tried from them is American Dream their cream style ale. This beer pours a pale orange with a nice white head. Aroma is pretty minimal but about what I expected from a cream ale. Taste was light crisp and very similar to a lager. Light body, almost no hop bitterness but very refreshing. Really enjoyable beer and a style that few are making. If you find yourself in Burlington this summer track down a bottle of American Dream. This is the fourth and final beer I brought home from Gneiss Brewing. You may have noticed a theme in the name of the brewery and their beers, geology. The brewer’s description below and their website have a lot more detail on the name of the brewery and the beers. I opened this one during the ice storm we had just prior to Christmas in Maine, seemed like a good time to drink stout. 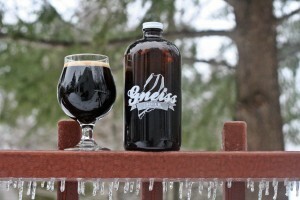 Obsius is a weizen stout (wheat stout) which is a style not often brewed. This beer is black with a thin tan head that went away quickly. The aroma was fairly tame but had some nice roasted malt and wheat. Obsius is very tasty with plenty plenty of roasted chocolate, minimal coffee which is a plus for me and a creamy mouth feel. Overall this is a nice change from the big imperial stouts that so many larger brewers choose to make. If you like dark beer but don’t want to be able to drink more than 12 ounces this is a good choice for you. Brewers Description: Obsius is a weizenstout, a wheat dominated stout brewed with our weiss yeast. Obsius is a rich and creamy beer with lots of roast and finishing with the bittering from the dark malts, not the hops. The name of this beer is derived from ancient mythology. According to the writings of Pliny the Elder, Obsuis was a Roman explorer who happened upon the stone we now know as Obsidian during his travels in Ethiopia. Obsidian is a naturally occurring volcanic glass. It is generally ejected from a volcanic explosion and cools so rapidly that no crystals form and the rock is smooth as glass. It is primarily silica oxide (70-75%) with magnesium and iron oxide contributions.